Aiming to simplify stock options to retail investors is Option Samurai and their option picking stock screener platform. In the wild world of trading, options are one of the more difficult products for retail investors to understand. As a derivative, they provide high upside, but not without risks. Aiming to simplify the process of choosing stock options is Option Samurai. Like many options analysis platforms, Option Samurai monitors different contracts and provides their potential risks and potential. What separates their platform is that their technology uses a strategy focus rather than a stock specific focus. As a result, rather than users querying up options chains of hundreds of contracts for each stock, Option Samurai filters options based on strategies. Examples include options where risk is limited to under $100, dividend capture strategies, and calls where the underlying stock has bullish momentum as well as volatility is expected to rise. Speaking to Option Samurai Founder Leav Graves, he explained to Finance Magnates that before creating Option Samurai he found that options analysis products tended to offer too many tools. Therefore, Graves felt that the platforms were lacking by adding an abundance of features, as they overcomplicated the options screening process. Aiming to create a solution, Graves explained that he set out to build a stock options platform with a focus on providing a simplified user experience. He added that despite the simplified approach, the platform does offer advanced analysis tools. However, in order not to confuse users, by default the more sophisticated features are hidden unless accessed by the user. Reviewing the platform, two major value adds that caught our eye that Option Samurai created for the retail market is a simplified version of presenting volatility and pre-set filters. Rather than presenting implied volatility (IV) as a number, Option Samurai uses a percentage figure to rank current IV. For example, if IV is 20%, it means that over the last 200 days, the stock’s current IV has been higher 80% of the time. As volatility is directly correlated to an option’s premium, traders can use the IV rank to find options that are currently trading with little volatility rated premiums, but whose stocks are also expected to experience an increase in activity. As part of the ranking system, Option Samurai also lists what a stock’s average daily range is as well as calculating the break even amount for each option. Putting these items together, traders can find options which have a breakeven price that is well within reach. Additionally, as part of its simplified approach, Option Samurai incorporates various strategy filters. Using this, traders can get lists of options across many different stocks that have opportune risk reward ratios. 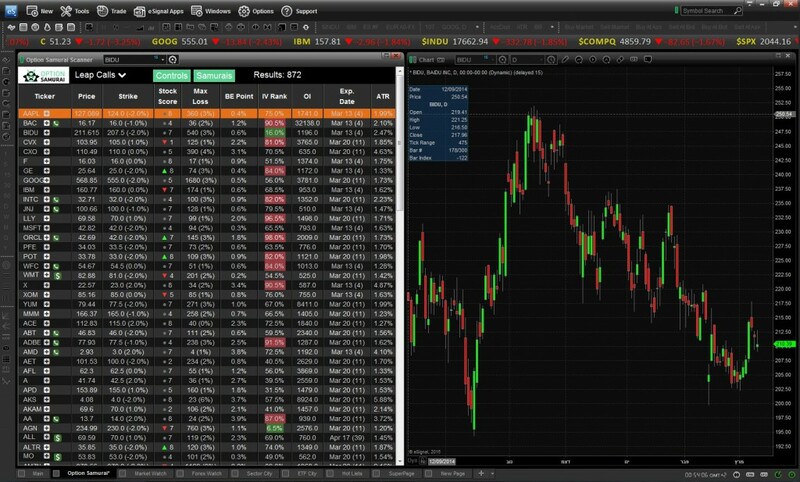 By using a cross-stock filter for finding options, users can circumvent the necessity to analyze option chains of multiple stocks. Once being filtered, traders can apply their own filter, by using the abovementioned tools such as the IV rank, breakeven point, price momentum, and a stock’s daily range. Being made available to individual investors, Option Samurai has also licensed the product to technology providers and brokers. Among them includes eSignal which has added the options screener as a plugin that appears directly on their trading platform. In addition, their analysis was integrated by trading education site, ChartYourTrade, which uses Option Samurai with their CAN SLIM stock screener model. Fintech Spotlight is a new column on Finance Magnates devoted to reviewing innovative financial technology companies and sector trends. You are either a professional knowing what you are doing – or entry level retail trader. Products oriented at the retail trader, requiring know how at a level of options trading, are wrongly positioned in the market – at a market segment where there are no clients !